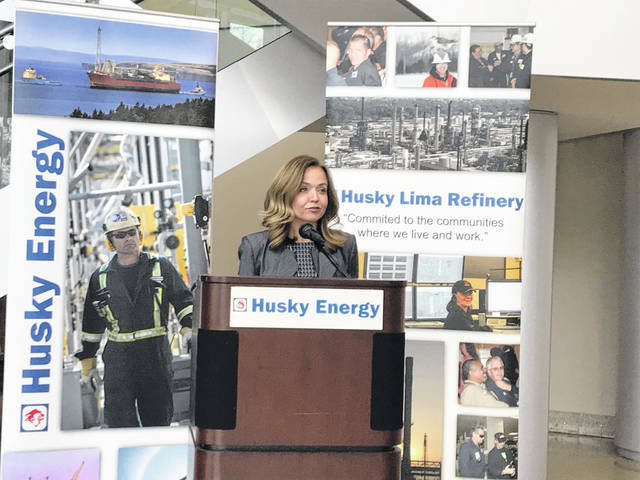 Amy Nusbaum, senior communications manager with the Husky Lima Refinery, held a press conference Thursday to highlight open positions at the refinery. LIMA — Husky Lima Refinery is hiring 20 process operators to fill vacancies left by retiring workers. The refinery is working with Ohio Means Jobs-Allen County to recruit new process operators in the hopes that the next training class will be hired by early summer. Nusbaum said the job requires physical and outdoor activity, as process operators are “responsible for the safe operation and maintenance.” Operators work 12-hour rotating shifts on a 60-hour, 20-hour work week rotation. Husky will be accepting applications through April 19. The Lima Refinery currently employs about 470 workers, with new employees added last year in anticipation of the refinery’s transition to heavy crude. Plant manager Claudio Ingaramo told The Lima News in March that refinery’s crude oil flexibility project should be complete by the end of 2019. The project will allow the Lima Refinery to process up to 40,000 barrels of heavy crude oil per day. Contract negotiations are underway at the Lima Refinery as well, with the current contract set to expire Monday. “We’re still trying to work towards an agreement that’s good with both sides,” Nusbaum said after a Thursday morning press conference. She said the process operator positions are unrelated to contract negotiations.